Kilimanjaro: One of the Seven Summits of the world and highest mountain in Africa! Since organizing our first Kilimanjaro expedition in 1989, every one of our Kilimanjaro teams has had a high percentage tag the summit of this majestic peak. Kilimanjaro, while non-technical, is a high-altitude summit and must be taken seriously. Climbers are at health risk from the altitude. Our guides always carry a Gamow (hyperbaric) Bag, pulse oximeter, and supplemental oxygen in case of Altitude Sickness. A couple hours in the bag can turn around Acute Mountain Sickness (AMS) before it forces you down or becomes life threatening. Every one of our climbs is led by a top-notch IMG high-altitude mountain guide, well-trained in all elements of climbing as well as wilderness medical procedure. 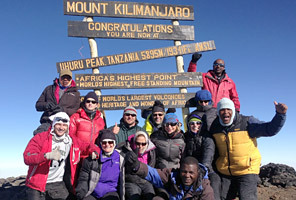 IMG Senior Guides have climbed and trekked all over the world and are always excited to visit Tanzania. We have a first-class staff of African Chagga guides and porters, all local people from the Chagga tribe who live right at the base of Kilimanjaro. Many of them have been on dozens of IMG trips over the years. They know we'll be coming back, they like working with us, and they deliver high quality service. We don't rush our ascent! Our program gives you a seven-day climb. We have learned that the extra time is well worth it for a successful and fun trek, giving climbers a far greater chance of standing on top and far less chance of altitude sickness. We add the benefit of a beautiful one-way Serengeti flight over Africa (easier, faster, more time to see animals, less time spent driving). Our groups usually fly out to Serengeti and drive back to Arusha with stops at Olduvai and Ngorongoro along the way, depending on the season (safari plans are subject to change). We are proud of the track record we have established over nearly 30 years with our Kilimanjaro trips and we know that we offer a fantastic trip for the money. We hope you can join us! I'm writing on behalf of my entire family to thank IMG for our fantastic trip to Kilimanjaro. My wife, two teenage children, and I all had an incredibly great time, both on the mountain and on safari. I'd recommend a trip to Kilimanjaro with IMG to any family seeking a challenging and fulfilling adventure. I am not an avid hiker, camper or climber, so there was a risk I might regret the whole trip. As it turns out, I had by far the best vacation of my life. I loved the challenge of climbing and doing it with my family. I loved Tanzania and the people there. And I really loved Eben [our IMG guide]... Thank you for making my 50th birthday trip so memorable! Discover East African wildlife in style. Get the best hero shots and sunsets in Africa.